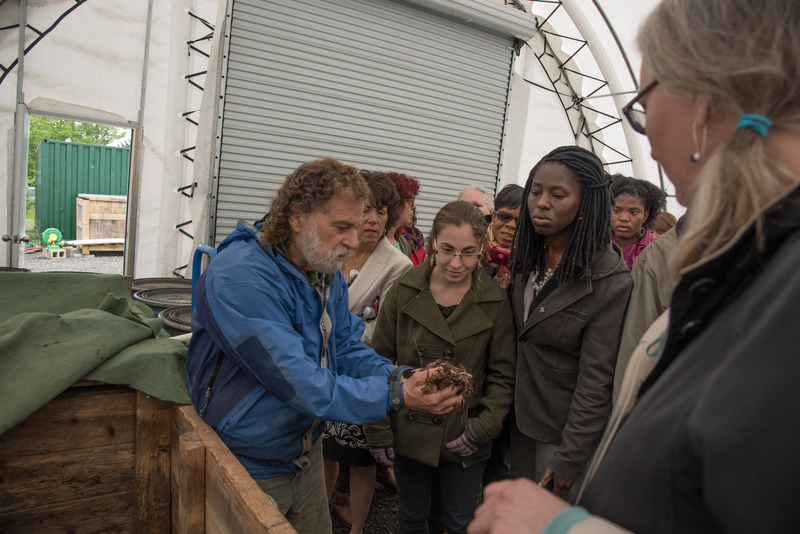 The Zoning Rewrite team hit the road on Wednesday, May 4, 2016 to learn more about urban agriculture in Prince George’s County. 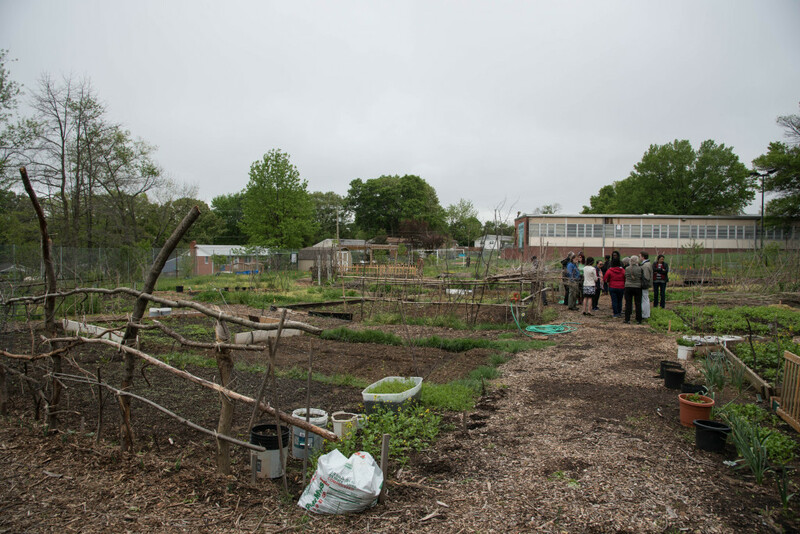 The four-site tour was organized by the Prince George’s County Food Equity Council and was an opportunity for the Zoning Rewrite team to better understand how urban farms and community gardens currently operate. 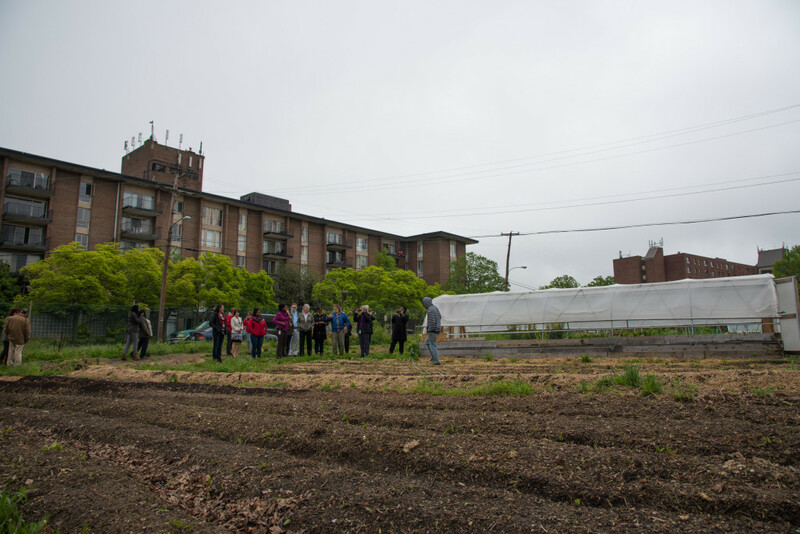 This experience was also beneficial so that the team can learn how the Zoning Rewrite can best support an innovative food system in the County. 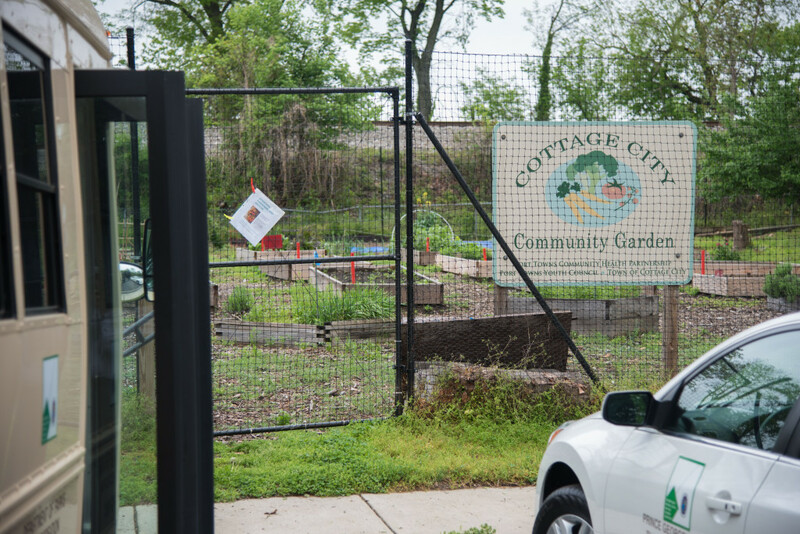 The Cottage City Community Garden was formed in 2007 as the first community garden in the Port Towns (Bladensburg, Colmar Manor, Cottage City, and Edmonston). The land for the garden was sold to the Town, and is currently under Town ownership, but is maintained by neighbor volunteers. One key takeaway of our visit to the Cottage City Community Garden is the height of the fence. Although Cottage City is a dense community, the garden abuts parkland and often has its fair share of wildlife including deer and groundhogs. Having a fence that is between six to eight feet tall helps to keep away pests and keeps the garden clean and safe for all. Established in 2010, ECO City Farms is an educational, nonprofit organization located in Bladensburg and Edmonston and is designed to serve as a prototype for sustainable local urban farming. ECO City Farm has been a vanguard in urban agriculture in Prince George’s County, working to get multiple pieces of legislation passed to help support urban farms. We visited the 3.5-acre farm in Bladensburg, which sat on the site of a recently demolished apartment building. ECO City Farms worked with local partners and the Prince George’s County Council to pass CB-26-2013, which permits urban farms in high-density residential zones. One of our major takeaways from our visit at ECO City Farms is that both small- and large-scale composting can be done in urban areas with little to no negative impacts (bad smell or pests) to surrounding neighbors. Development standards in the Zoning Ordinance should adequately address varying types of composting systems particularly in urban communities. 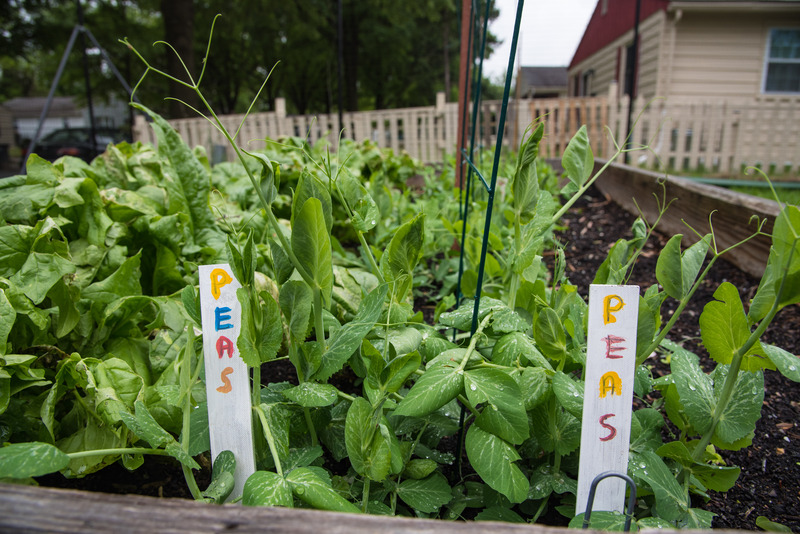 Operated by University of Maryland Extension, the Field of Greens Community Garden offers 150-square-foot plots for individuals and families, a youth garden for student groups, and a food forest. The garden was started to expand sustainable urban agriculture opportunities in the Riverdale community, especially reaching out to the local refugee families lacking access to land. 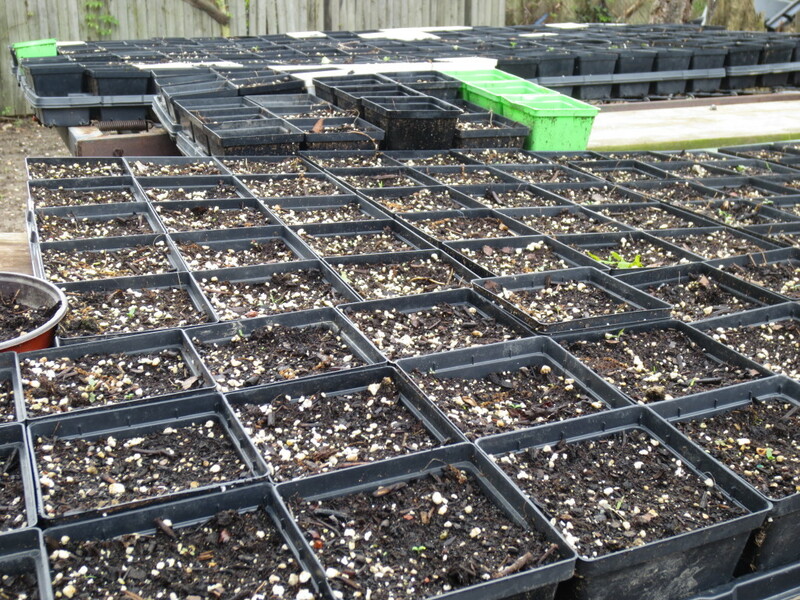 The Field of Greens Community Garden is a great example of urban agriculture being used as a form of adaptive reuse. The garden is a part of the Center for Educational Partnership which is housed in the former Riverdale Hills Elementary School. It is key for community gardens to have close access to water sources. It may be helpful to encourage community garden sites that are located near water hydrants or downspouts so that they can collect rainwater for plants. Rosa Linares operates a small private farm in Adelphi, Maryland. Much of her produce is sold at local farmers markets to immigrant families. On two acres of land, Rosa grows a variety of vegetables, including chipilin, which is one of her most popular items. This farm showcases the growth of Prince George’s County over the past 50 years. Although Rosa’s land is zoned Rural Residential, her community has grown to become one of the most densely populated neighborhoods in the County. Neighborhood compatibility standards may be helpful for private commercial farms operating in urban communities. BONUS: Council Member Mary Lehman, District 1, Prince George’s County Council, joined the group during our visits at ECO City Farm and Field of Greens. She briefed the group on the County’s commitment to expanding urban agriculture and about legislation that the County has passed or currently has in the works. In fact, one day prior to our urban agriculture tour, Council Member Lehman presented CB-25-2016 to the County Council. This legislation would allow urban farming in more residential zones subject to certain requirements. Additionally, this bill would expand the definition of urban farms to include private operations, as currently only nonprofit organizations are permitted to operate urban farms in the County. When working collaboratively, we can find innovative solutions to create a vibrant and sustainable food system in Prince George’s County. We enjoyed hosting the Planning Department’s Zoning Ordinance Rewrite Team on this Urban Agriculture Tour! If you’re interested in learning more about the Prince George’s County Food Equity Council and our work on the County’s Comprehensive Zoning Ordinance Rewrite, visit http://www.pgcfec.org. Thanks Sydney! We really enjoyed participating in the Urban Agriculture Tour with the Food Equity Council. It was a great way for us to learn more about the urban ag in the County and ways that the Zoning Ordinance can support healthy food access for all!